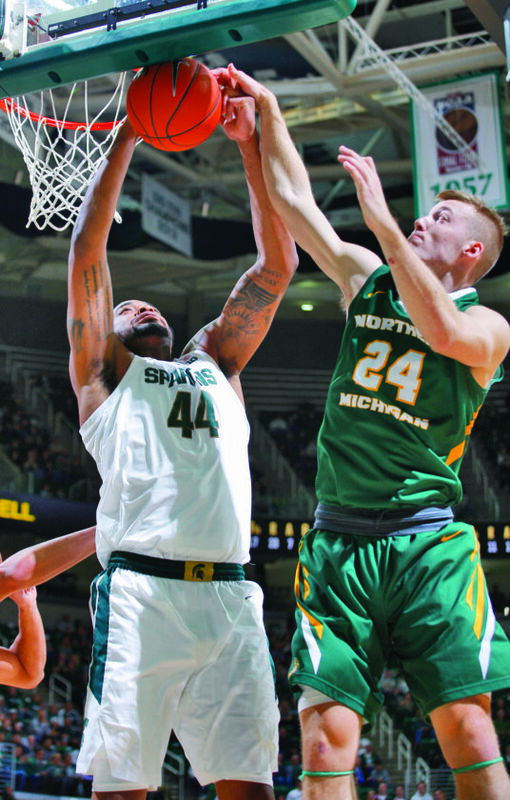 EAST LANSING — Michigan State head coach Tom Izzo is arguably Northern Michigan University’s most famous basketball alum and the legendary coach’s current squad pounded its way past his alma mater Tuesday night. In an exhibition game at the Breslin Center, the No. 10 Spartans held the Wildcats to only 13 points in the first half and rolled to a 93-47 victory. MSU had four players finish in double-figures with Nick Ward leading the way with 24. Point guard Naba Echols led NMU with 23 points. Despite what the final score says, the game was reasonably close early on as a three-point play from Northern’s Isaiah Johnson cut the Wildcats’ deficit to 9-7. However, it was all Spartans from that point on. MSU went on a 22-0 run in the span of eight minutes and a trey from Cassius Winston put the Spartans up 31-7. The Wildcats played better in the second half as Echols dropped in 15 points, but the deficit was much too large to overcome. NMU will hold a Green/Gold scrimmage at 3 p.m. Saturday in the Berry Events Center and will open the regular season Saturday, Nov. 10 at 11 a.m. against McKendree.